City comptroller John Liu (劉醇逸), who will become New York’s first Taiwan-born state senator. 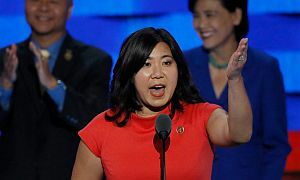 U.S. Representative Grace Meng (孟昭文) easily won her fourth term serving New York’s 6th congressional district, winning 91 percent of the vote to secure re-election to the House of Representatives. American Institute in Taiwan (AIT) Chairman James Moriarty said the results of the United States midterm elections would not affect the country’s policy towards Taiwan.